i think this book is great and i really want to read it i give it 5 stars out of 5. This book is very nice and really good i hope that people like this book. Jack Frost is up to mischief again! This time he asked his goblins to take Weather Fairies’ magical Fairies. Can Rachel and Kirsty help before it’s too late… and the whole town covered in lots of warm and cold weather? Great book. It all started when Rachel Walker and her Mum were driving home in the car with the groceries. Rachel thought of letting her best friend, Kirsty Tate, come over for the week. Kirsty and Rachel had met on Rainspell Island and rescued the Rainbow Fairies. When Rachel and her Mum were trying to take the groceries in, it started snowing! Then Crystal The Snow Fairy appeared! She told Rachel and Kirsty how the greedy goblins stole the Weather Fairies’s magic feathers. So the girls and Crystal went out to find Crystal’s magic feather. They soon found it. But how are they going to get it from a goblin? Are they going to trick him? I like crystal she is very pretty. i chose this book cos i like snow cos i cant get to school and here is some of the story. “Isn;t it a lovely day, mum?” Kirsty Tate said happily, as she gazed out of the car window at the blue sky and sunshine. “Do you think it will stay like this all through the summer holidays?” Mrs Tate laughed.”Well, lets hope so,” she said. “Remember what the weather was like on Rainspell island. 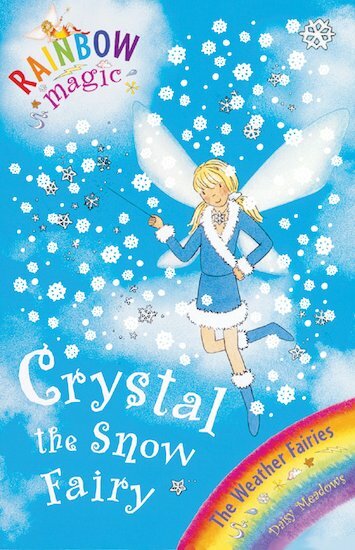 This is the first book in the exciting weather fairies series. Kirsty’s dad finds a weather vane rooster and that rooster turns out to be a magical one. Rachel comes to stay with Kirsty and they even meet Crystal the snow fairy, but will the goblins be harder to defeat when their taller?!?! Read and find out!